By this point you’ve no doubt seen the Microsoft Office meets iPad image floating around (if not, look up). 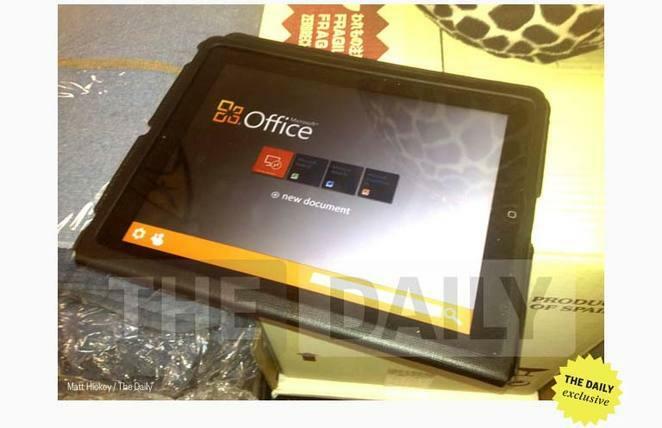 The Daily claimed it had been able to demo the application and broke the news that Office Suite for iOS would launch well before Windows 8 (within the coming weeks). The tech world was abuzz with excitement and anxiety – what does it all mean?! Then a Microsoft spokesperson got in touch with ZDNet. And here’s how the war or words went on… and on and on and on. A spokesperson announced the image we all saw on The Daily was not the real thing. The company wouldn’t say whether or not they were planning on bringing such a product to the iPad. And then, Microsoft issued a nice non-response – being that the company had nothing more to say about all of this. What’s with all the back and forth? Ha says that the app was demoed for The Daily, so why would Microsoft outright deny – nay, basically accuse the publication of forging an image – after allegedly trying to create some hype around the release? If The Daily had said unkind things about Office Suite for iPad, that would have been one thing. But really, it’s a bare bones run down of what the app is and when it should launch. It could that a Microsoft employee of some sort was at the same bar as Hickey, and showed off the app – at least, that is really, really what it sounds like. Hickey also revealed how he came across that now infamous image: “…Got the scoop in a cap hill bar, but had to go to Belltown to track down the shot, 007-style” he says via Twitter. Of the photo, he says it was taken in a manager’s office in a bar. “They were afraid to show it off in public.” Capitol Hill and Belltown are outlying areas of Seattle, Washington, near where Microsoft has corporate offices. That’s a lot of details for something Microsoft was willing to deny being “the real thing.” But maybe Microsoft is just choosing its words rather carefully – perhaps what Hickey saw was not the final version, despite how polished he thought it was. Of course, there are other possibilities like the whole thing is a bizarre hoax, or the program was an unofficial hack. Since the Office Suite on iPad rumor began, we’ve been somewhat befuddled by the move. It would seem like this would be a big sell for upcoming Windows 8 tablets, which are reveling in the hype as is. Why would Microsoft offer up this exclusive software to such a major competitor? Timing and pricing would have to be executed so perfectly to avoid this actually coming back to bite Microsoft. We’ll likely know more tomorrow, as The Daily has hinted Microsoft won’t be a fan of an upcoming post. This is all started to feel like a very watered-down reenactment of the iPhone 4-Gizmodo incident.